Home ice cream How To Cake With Ice Cream Inside And Roasted (Baked) Recipe? How To Cake With Ice Cream Inside And Roasted (Baked) Recipe? I bet you've never baked, roasted ice cream! This is your chance, and I swear that this method is infallible for BBQ, Ice Cream Cake and oh, so easy! All you need is a small meeting and you eat a deep-fried ice cream cake! 1. Preheat the grill to the highest temperature or 500-700 degrees. 2. Halve the cake in the longest. Spread the strawberry jam generously over the inside of both halves. 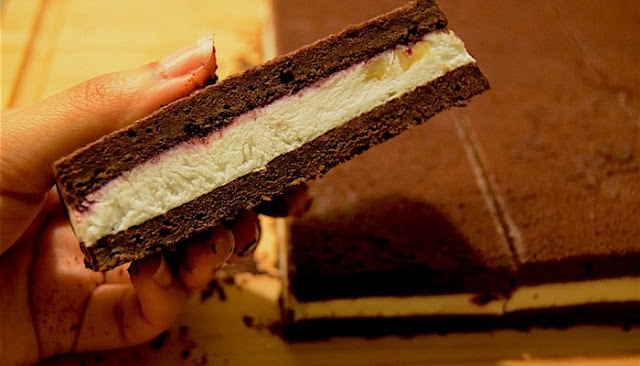 Add ice-cream sandwiches in a layer on top of the bottom half and finish with the top half of the cake as the top layer. 3. Place the filled sponge cake on a wooden board covered with a few layers of aluminum foil. 4. Cover the cake generously with the prepared meringue, making sure you cover every inch and that there are no spots on the ground. 5. Place a meringue-coated pancake on an aluminum foil grid and close the lid for a few minutes. 6. Cut and serve immediately. Heat the oven to 350 degrees F. Flour flour and baking powder in a bowl. Beat the eggs in a blender equipped with the high-speed whipper until they are light and weak, 5 to 6 minutes. Slowly pour the sugar over medium heat and mix until the thickness and clarity, about 1 to 2 minutes, then add the orange peel. Do not fold the sifted flour with a spatula until it has been processed, do not mix it too much. Pour the mixture into the prepared form and bake until a centered cake taste is clean for about 20 minutes. Let the cake cool down on a rack and pull a knife through the sides of the pan to loosen it and take it out of the mold. Dissolve the gelatine in 2 tablespoons of hot water in a small bowl. Beat the ricotta, sugar and the unpalatable sugar in a blender equipped with the paddle attachment at medium speed until smooth for about 2 minutes. Scrape the dissolved gelatine and mix to disperse. Add the chocolate and lemon zest with a spatula. Bring the sugar to the boil with 1 cup of water in a small saucepan. Cooking is reduced to about a quarter, about 2 to 3 minutes. Remove from the heat and pick up the Grand Marnier. Align the inside of a 9-inch bowl with a plastic wrap so that a few inches of the excess wrap covers the outside. Cut the cake into three circular layers of equal thickness with a serrated knife. Align the bottom of the dish with a cake, pie, squeeze it together and brush with a little syrup to make it even. Fill half of the shell with the cake and part of the filling. Place another layer of cake on the filling, squeeze it so that it fits well on the sides of the bowl and then brush with more syrup. Continue filling the cavity with the remaining filling and adjust the flat top layer. Soak the last layer with the remaining syrup. Fold the remaining plastic over the top and weigh the top with a heavy plate. Cool during the night or until filling is complete; When it is filled with ice, place it in the freezer. Sift the sugar from the confectioners into a large bowl and mix the lemon juice to get a smooth, spreadable layer of glaze. If necessary, add some icing sugar or some water to get the right consistency. Remove the cake from the bowl and take it out. Invest with the dome on a cake or stand. Put the icing on the cake and let it slide on the sides. Cover the cake complete with a spatula. Leave the glaze at room temperature before serving. Preheat the oven to 350 ° F. Place the bottom of a 9-inch cake pan with grease-proof paper or parchment and spray with an anti-stick cooking spray. Mix sugar, vanilla, salt, sour cream and egg in a medium bowl. Use a rubber spatula to carefully fold the flour, the baking powder and the baking powder over the wet ingredients. Add butter, chocolate chips and pecans. Do not mix. Pour the mixture into a uniform layer in the tart mold. Place the pan in the middle of the oven and bake until a pancake maker comes out of the middle for 20 to 25 minutes. Cool in a bowl and disinfect. Cover the same cake tin with plastic foil (overlay) and put the ice in the spoon. Cover the top with plastic and press gently until it takes the form of the cake mold. Remove the plastic from the top of the ice and place the layer of the cake on the ice in the pan so that the bottom of the cake is facing upwards. Press gently to let the ice stick to the cake. Put the cake back in the freezer. Place the candies and water in a microwave-safe container. Microwave in height for 1 minute or until the candies melt, stir after 30 seconds. Add a ½ cup of walnuts to cover the caramel. Spread them out on a baking tray. Keep all remaining hot sweets, cupcakes in the bowl. Put the chocolate and cream in a double boiler. Heat until the chocolate melts and keep it warm. Put the cake in a bowl and drizzle with the peeled walnuts with caramel, sprinkle with the caramel, drizzle with the chocolate and cover with the remaining nuts. Serve immediately or freeze until finished.